We would like to congratulate Cameron Parmigiani on his commitment to University of St. Francis! Here are Cameron’s recruiting story and interview after his commitment. Good luck as a Fighting Saint! Next year, I will be attending the University of St. Francis, in Joliet, Illinois. I chose them for their location, school size, feel of the school, athletic prowess, and relation to the coaching staff. SportsForce helped guide me through the minefield of the college athletic recruiting process by telling me how to handle business, and how to approach the coaches with questions or concerns I may have had. I would definitely recommend that perspective college student athletes get a head start, earlier than I did, in order to get the roster spot they may deserve before it fills up. The highlight video was a notably big part of my recruitment, so I absolutely would recommend that as well. One piece of advice for them, though, would be to choose a school where you could also see yourself attending without playing your sport. Say you get severely injured after your first year, you don’t want to be stuck there; unhappy, and have to transfer and begin the search again. Just something to think about. I am STOKED for my college basketball career, and I know that I have chosen the right school for me! Because of the help from SportsForce, we will be saving over 50% of our college costs through my athletic and academic scholarships. 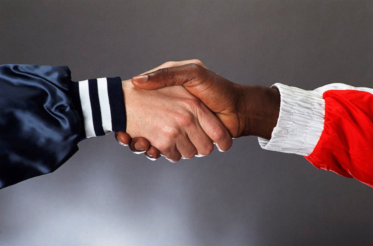 To greatly improve your chances of competing at the collegiate level, it’s critical to understand the importance of building and sustaining personal relationships with college coaches. This is sometimes the essential separator between two equal recruiting candidates. 1. Take time to learn about the school, the coaches, and the sports program. Go online and read about the coaching staff backgrounds along with the programs’ successes and challenges. Learn about the conference they compete in and the other teams they play against. Understand the current roster of players and where you might fit in based on your specific position, measurables or stats. Learn about the school academically and be prepared to share with the coach why it is a top fit school/program for you. Keep notes next to the phone to help remember key things you want to discuss with the coach. Keep a journal of personal notes about your calls for future decision-making purposes. 2. Ask intentional questions. Before a call or meeting, write out a list of questions that you want to learn about the school and the coach. College coaches always appreciate well thought out and intelligent questions. Some things to uncover in these conversations may include the programs’ graduation rates, team GPA, team goals, in-season and off-season training schedules/expectations, team bonding events and how the coach sees you fitting in the program. 3. Be memorable – write a hand written note. After a conversation or meeting with a coach, write a hand written note thanking him or her for their time. At the very least, send a thank you email within 24-48 hours. 4. Introduce yourself at camps. Don’t be intimidated or afraid to walk up to each coach and introduce yourself. Let them know your name, high school, grad year, position and that you’re excited to be there. To make this first introduction even easier, send the coaches in attendance a letter prior to the camp, along with your game video so they have a better chance of remembering you. 5. Stay connected. At the end of a call or meeting, ask the coach if it would be okay to email and update each other every 1-2 months. Also, ask what social media platform they prefer and keep in touch that way as well. Monitoring the success of a college program and or congratulating the coach shows you have a strong interest in their school/program. Maintaining consistent touchpoints and building personal relationships with college coaches will typically produce very positive recruiting results. Results that will help you to determine your best-fit school, best coaching staff, best athletic/academic programs, best offer and the best future career opportunities. 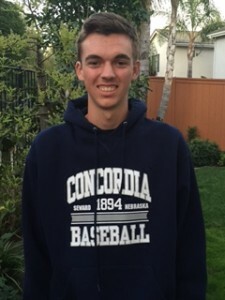 We would like to congratulate Jake Fosgett on his commitment to Concordia University of Nebraska! Here are Jake’s recruiting story and interview after his commitment. Good luck as a Bulldog! My college recruiting process began a little later than what probably would have been ideal. I began after the summer of my sophomore year in high school, following a solid season of pitching for San Dieguito Academy. The only time I really showcased myself was when I participated in tournaments trying to get some exposure from college scouts/coaches. During my junior year in high school, I teamed up with SportsForce to get actual advice from people with actual experience in the field of recruiting. I was given LOTS of help from the SportsForce guys. I got some recruiting knowledge such as: what questions to ask coaches, how to contact those coaches, and how to effectively proceed through the recruiting process. Helpful tips for my pitching form were even given in areas that needed to be improved upon. All this eventually led me to perform in a Prospect camp that put me in contact with my future coach at Concordia. 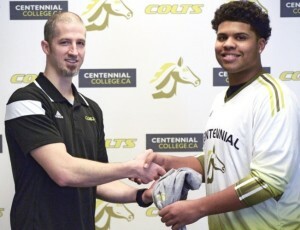 He was impressed at how well I performed on and off the field, including grades, and showed a strong interest in me for his team. I committed in October of 2015, three months after coming in contact with the coach at my school. I am going to Concordia University of Nebraska. The two main reasons I chose the school would have to be the baseball coach there and the strong education that I am anxious to receive in my major of Computer Sciences. As I said before, SportsForce gave me an abundant wealth of advice that helped me converse and contact college scouts and coaches. I’d say that one very important thing would be to start as early as you can. The first big step you should take is during your freshman and sophomore year. If you’re starting a little later, as I did, don’t panic! However, you will need to give more dedication to participating in tournaments, camps, and showcases in a shorter amount of time. I’m very excited for college. Obviously, I’m quite nervous for it, but feel I made a great decision going to Concordia where there are some really cool baseball guys that will be my future teammates. I currently have a $17,000 scholarship to go to Concordia, which is half the Out-of-State cost. For four years, that is $68,000 in savings for college. I would recommend SportsForce to anybody willing to put in all the necessary effort for college and baseball, and then some. If you’re going to be a student athlete with SportsForce, then grades, baseball, and family are going to need to become your top priorities to succeed in the recruiting process. 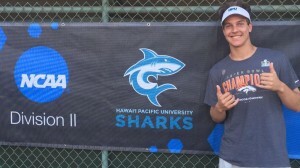 We would like to congratulate Tyler Hazlett on his commitment to Hawaii Pacific University! Here are Tyler’s recruiting story and interview after his commitment. Good luck as a Shark! 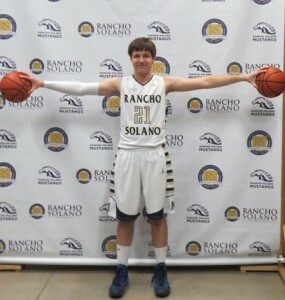 I play for a small Division 5 high school team in Temple City, California. I began participating in baseball showcases in December of my junior year. While attending a baseball camp at USC, I met the General Manager for Trosky Baseball and later that year was asked to play for the Trosky 18U team the next summer. Playing for Trosky was the best experience of my high school career and consistently put me in front of dozens of college coaches. We quickly realized that even starting the recruiting process as a junior we were somewhat behind. Some of my Trosky teammates were committing as sophomores and juniors. We felt behind in the process from the beginning. My coaches and I knew I would play somewhere but we didn’t know where. I didn’t commit until the middle of my senior year. I committed to attend play baseball for Hawaii Pacific University in February of my senior year. I was being watched by many colleges and actively recruited by a handful. I visited the campuses and met with the coaching staff of the schools that were actively recruiting me. This was a very important experience and all I can say is I just knew that HPU was the right college for me. I considered the education, campus, location, team, coaching staff and the opportunity to make an immediate impact. The home field is not the best and the campus is not very traditional, but it all feels right to me. I met several families from Hawaii while playing for Trosky and the love and kindness they showed me and my family also influenced my decision. My mom heard a presentation from SportsForce at a college showcase and told my dad we needed to look into their service. We set up a phone call with Andrew (Beinbrink, CEO/Co-Founder of SportsForce) and he gave us some valuable advice about the recruiting process and what was required to be marketable. We decided to sign up because it seemed like Andrew really understood the process and we felt like we were already behind. My dad tells his friends that the recruiting process is another full-time job. My initial list had 50 possible schools from NCAA Division I to Division III. In baseball, there are only so many coaches and even fewer opportunities for them to see you play. Communicating to coaches when and where they can see you is the most important piece of the puzzle. SportsForce helped us email every single coach on the college staff on my target list before every game or tournament. SportsForce also helped us determine if a coach was really interested in me or just marketing their program. An invitation to a camp is not the same as a phone call or text message from a coach. The process is different for every single person, start early but don’t be discouraged if you do start late. It’s hard to believe early means freshman year or earlier for some, but that’s what it means in baseball. A highlight video is a must and has to be short and focused, but playing or showcasing in front of coaches is most important. Be flexible, schools I thought I wanted to attend didn’t feel right when I actually visited the campus. Grades are also extremely important. A GPA of 3.5 and above puts you in a different category for coaches and impacts the amount of academic money a college can offer you. A coach has a lot more flexibility when he can rely on your academic achievement. My offer was stacked with an academic scholarship and an athletic scholarship. The process is not easy! Responding to emails from coaches can take hours after a game or tournament. You need to be organized and I relied on my parents a lot. My dad had his friends call me as mock college coaches so I would be prepared when the phone calls came. Research the schools you are interested in and be able to talk about yourself and what you like and don’t like about a school. Be honest with the coach and yourself and make sure it feels right to you. I am extremely happy with my choice and look forward to a great college experience. I love the campus, the coaches, the people and the food. And hey, the location is Hawaii. My offer is for $18,000 a year, so we will save $72,000 over the four years. I play for Trosky Mizuno and we play and travel a lot in the summer. My Dad said we would not have been able to manage the email communication without SportsForce. SportsForce started out sending over two hundred emails at a time for me when we started. Darrell (Mazon, Co-Director of Client Team at SportsForce) kept me on task and made sure I got my emails to coaches in time so they would be able to schedule a time to see me at games and tournaments. When communication and offers started coming in, Andrew was there to provide advice. One of the best parts was that I was able to see which coaches watched my video and which coaches opened my emails. It’s your son or daughter’s senior year in high school. They just received an official visit invitation from a college coach. The dream of playing their sport in college is within reach. Given the intense competitiveness of college recruiting, the invitation is a special honor. It means your student-athlete is being recognized for their hard work, dedication, and achievements. There’s no doubt this college coach is very interested in having them become a member of their team. However, waiting until your child’s senior year and hoping for an official visit invitation may be inadvertently risking their ability to generate offers from other coaches/colleges. The unofficial visit is any visit by you and your parents to a college campus paid for by you or your parents. During an official visit, the college can pay for transportation to and from the college for you, lodging and meals. Before a Division I college or university may invite you on an official visit, you must be a senior and will have to provide the college with a copy of your high school transcript and ACT, SAT or PLAN score and register with the NCAA Eligibility Center. There are three main factors driving the importance of the unofficial visit in college recruiting today. College coaches are recruiting younger and younger student-athletes every year. Although each sport has its own NCAA recruiting guidelines and nuances, it’s not uncommon for high school freshman and sophomores to receive D1 verbal offers. These earlier recruiting cycles mean that college coaches cannot risk losing a top recruit by waiting until a prospect’s senior year to offer them an official visit. As a parent, it makes sense to want to minimize your costs and hope that an official visit invitation materializes in your son or daughter’s senior year. However, by not actively pursuing other realistic roster spots, you’re potentially diminishing their ability to generate verbal offers from other coaches/programs that are recruiting much earlier than that. College sports programs have limited resources to locate and attract proper-fit high school student-athletes. Although each college and university establish their own recruiting budget and allocation per sports program, let’s look at the University of Notre Dame as an example. A few years ago, the Fighting Irish had one of the highest annual college recruiting expenditures in the nation, spending approximately $2,000,000.00 for all of their sports programs. To add perspective, Notre Dame’s $2,000,000.00 figure easily doubles, triples or quadruples that of many other low to mid-NCAA DI programs. Relating Notre Dame’s recruiting expenditures to NCAA DII and DIII programs would be like comparing the gross national product of the U.S to that of Denmark. There simply is no comparison. The two sports programs in any school that normally dominate recruiting budgets are football and basketball. The simple reason: they typically produce higher revenue generating opportunities for their school. At Notre Dame, 75% or approximately $1.5 million dollars was spent on 3 sports programs: football and men’s/women’s basketball (with football consuming the lion’s share at $1,000,000.00). There are almost 8 million high school student-athletes in the U.S. Roughly 65% of all college recruiting expenditures to go towards travel costs (i.e. airfare, hotels, transportation, entertainment, and on/ off campus recruiting activities). Given these figures, and knowing that most colleges have far less money to spend on recruiting than a school like Notre Dame, it’s easy to see why college sports programs have a difficult time locating and evaluating all of the talented high school student-athletes in the U.S and abroad. They simply do not have the resources to accomplish the task. This is even more evident if your student-athlete competes in sports outside of football and basketball. An unofficial visit allows the opportunity for your son or daughter to begin building a personal relationship with a coaching staff outside of stated contact rules and windows. From the coaches’ perspective, these visits provide an invaluable opportunity to meet with a recruit face to face and learn more about their backgrounds, upcoming competition schedules, and personality. It allows the coach to legally meet a recruit outside of established “contact” rules and does not adversely impact their minimal recruiting budgets. A coach knows that when a family pays to travel for an unofficial visit, they probably have a genuine interest in their school/sports program and are not just fishing for an offer. For the families, these visits provide invaluable information as to the viability of a school and sports program being a potentially good fit for their student-athlete. It’s one thing to see and learn about a school and sports program on-line and quite another to see it all first hand by meeting the coach, walking the campus, visiting a classroom, eating the food and meeting with administrators. If time permits and the travel costs fall within the family budget, an unofficial visit can produce tangible outcomes and results. It may ultimately provide your son or daughter a distinct advantage over other recruits that have not personally met with the coach. In the previous blog post, we discussed that waiting until a child’s senior year to receive an official visit invitation may be risking their ability to generate offers from other coaches/colleges. Instead, there is still the opportunity to make unofficial visits. Do not just show up on campus unannounced and ask to meet with the coach. If you do, more likely than not, you will be handed to an assistant coach who is being pulled away from a project or deadline and will have little time for you. This may end up as a less than ideal visit. Have your son or daughter email the college coach approximately 2-3 weeks before your planned visit and provide your schedule availability. In the same email, share specific athletic and academic background information, video and grad year. In the email, ask if the background matches the coaches’ recruiting needs. If the coach sends a generic response, politely responds there is not a match at this time, or does not respond back to one or two email attempts, don’t schedule the visit. If the coach responds in the affirmative, schedule the visit. Then be prepared to ask the coach well thought out questions about him/her and their program. Be prepared to answer questions the coach will ask you. Be able to articulate why this school is a potentially good fit for you. Other important things to do on the visit include: scheduling a meeting with admissions, financial aid, or academic departments of interest, visiting a dormitory, sitting in a classroom, eating in the cafeteria and taking an official tour of the campus. It is wise to visit colleges at different division levels to gain a clearer perspective of their offerings and opportunities. Beginning this process as a freshman or sophomore provides ample opportunities to visit and meet coaches at realistic target schools. Most families have limited travel budgets. So pick your unofficial visits wisely. Save money by trying to coordinate visits with your club team’s tournament travel schedule or family vacations. This recruiting strategy may ultimately help your child play their sport at a college that best meets their athletic, academic, financial, social and geographic needs.